Thus spoke Leonardo Da Vinci as he waxed poetic on the mysteries and wonders of the human eye. He could have just as easily, though, been describing the mysteries and wonders of the camera obscura and its successor, the Pinhole Camera. The methodology of pinhole optics was first recorded back in the 5th century B.C. when the Chinese philosopher Mo Tsu noticed that images appeared inverted when projected through a small hole or ‘pinhole’ in a darkened room. He later referred to this as a “collecting plate” or “locked treasure room”. Translated from its original latin, camera for “room”, obscura for “dark”; the camera obscura can be any sealed, lightfast enclosure with a hole to admit ambient light, and an opposing inner surface to reflect and view the projected image. To a more or less degree, every illuminated object reflects light. The pinhole allows this reflected light to pass through the small opening (relative to the enclosure’s size) and project a perfectly linear, distortion free, albeit inverted, reflection of the subject. Later refinements saw the addition of lenses and mirrors within the enclosure to ‘right’ the upside-down image—photographic principles that are still in use today. Justin Quinnell, a photographer in Great Britain, has devised a pinhole camera for your mouth. He’s dubbed it the “Smileycam”. And then there’s also the garbageman from Germany who’s turning dumpsters into pinhole cameras. What does he call it? The “Trashcam”, of course. A popular small-form pinhole is this 35mm film canister method. The largest camera obscura in the world—the Camera Obscura in Aberystwyth, Wales, boasts a fourteen inch lens and reflects a 360 degree sweep of the surrounding sea and landscape. Yes, you can literally stand inside the camera/building! Aside from the mere entertainment value of the camera obscura, some of the Renaissance and Dutch masters were reputed to have used this device in the creation of some of their most celebrated works, allowing them to achieve near photo-realistic, distortion-free perspective in the layout and composition of their paintings. The transformation of the camera obscura from a viewing and drawing tool, to a true recording device, happened in 1850 when Scottish scientist Sir David Brewster took the first known pinhole photograph. He is also believed to have coined the term “pin-hole” in his 1856 book, The Stereoscope. With the addition of the film component, the pinhole camera was born. 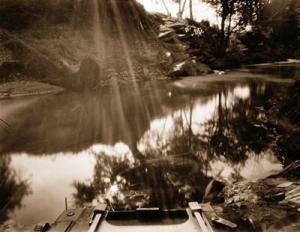 Today, pinhole art is considered a legitimate sub-genré of photography. In addition to its place in art, pinhole cameras have proven their value to the hard sciences through their use in space flight and for high energy photography in the nuclear industry’s laser plasma research. 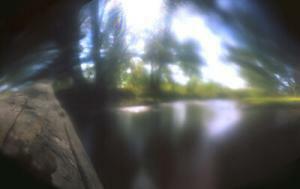 Perhaps the defining characteristic of the pinhole is the absence of a “proper” lens. With only the atmosphere separating emulsion and subject, the camera’s depth of field is nearly infinite, wide angle images appear almost distortion-free. 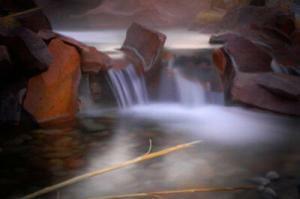 Sounds simple enough, but the Pinhole is hardly without its quirks. Since the device operates without a viewfinder, framing ones subject can be a hit or miss proposition. Once, however, the photographer gains familiarity with his/her chosen camera, they will gain a feel for position and placement. This placement, along with timing and exposure, relies heavily on the artist’s intuition and expertise. “Shutter” operation is a manual proposition, to say the least. Methods run the gamut, from electricians tape to, in the case of photographer Jody Aker’s modified Speed Graphic—a velcroed-on Grateful Dead patch. Despite what some would call “limitations”, many accomplished fine art photographers revere this simplistic approach to their craft for the stripping away of technology that, may or may not, help in the creation of photographic art. Twenty years ago, noted Colorado lensman, David Sharpe, felt “boxed in” by the sometimes tedious nature of traditional photography. He liked the way the Pinhole allowed for a more poetic interpretation of his subject matter—without the often cloying technology that had come to define modern photography. Hooked for good, Sharpe embraced the pinhole aesthetic and never looked back. Although he agrees that the pinhole leaves a lot to chance, Sharpe actually likes not having to look through the viewfinder, relying instead on the intuitive feel that the pinhole requires of its adherents. “I love the alternative approach; the softer, not as ‘dead-on’ nature of this medium.”, David observes. 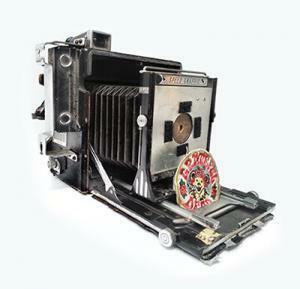 Sharpe’s platform of choice is the “small-form” film canister pinhole. Typically, he will bring 16 to 19 of these set-ups on photo excursions. Experimenting with different focal lengths and short exposure times, David has achieved amazing results with what he calls his “pinhole instamatics”. Often, an artist will, at some point in their career, decide if they are photographing for the image or for the process. Many artists will agree that the process IS the art, or at least as important as the final image itself. The beauty of the pinhole camera, is that it lends itself so well to this creative process by almost forcing one to engage the subconscious creative power that technology often subverts. 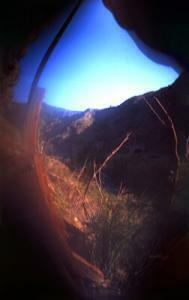 The pinhole camera doesn’t overwhelm or try to ‘lead’ the artist with endless technology-driven choices. 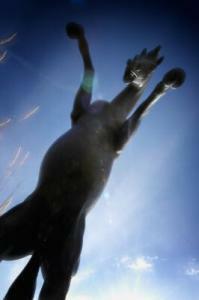 It is a collaborator that, by way of an almost misleading simplicity, works with the artist to reveal the art within. 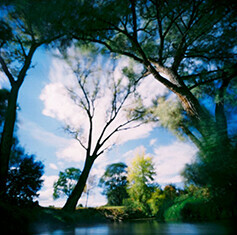 April 28th is Worldwide Pinhole Photography Day. To celebrate, we have made this week’s Facebook Photo Theme, drumroll please… “Pinhole” Drop by our Facebook Page and show us your stuff.